Janice Sellers just got a job, ending a five-year drought in employment. While waiting in line at the Food for Families pantry distribution, Sellers said the free food "helps me out a lot." 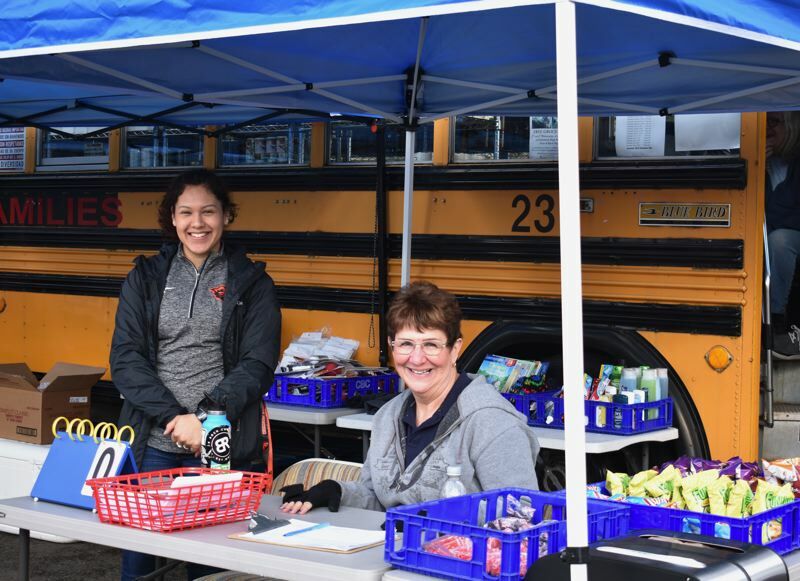 A regular at the yellow school bus in the Centennial High School parking lot for about 18 months, Sellers said when she can, she shares the food with others in her extended family who have also been out of work. Dozens of people — mostly women — descend on the high school parking lot twice a month, lining up and taking a number for their turn to pass through the bus to get food to tide over their families through hungry times. This is the Food for Families food pantry, staffed mostly by student volunteers from the high school. The nonprofit pantry just joined the Gresham Area Chamber of Commerce and hopes that will strengthen its ties to the community. Danliz Rodriguez picks out provisions to feed her and her son. It's only her third time on the bus, and she is grateful. "It's good healthy food," she said, looking over the canned goods, frozen blueberries, milk, frozen chicken and other meat. A woman named Ionela, who didn't want to give her last name, said she and her husband and seven children moved to a larger home, and the uptick in expense made it difficult to pay their bills, even though her husband is working. "I was kind of shy to do it," she said of Food for Families, but added, "this is an amazing help. It really is." Established in 2015, Food for Families was the brainchild of RE/MAX real estate agent Shar Giard, a former Centennial School Board member. She discussed the concept at a Future Business Leaders of America club meeting at Centennial High School and members expressed enthusiasm about the project. "I handed it over to FBLA, and they just ran with it," she said. 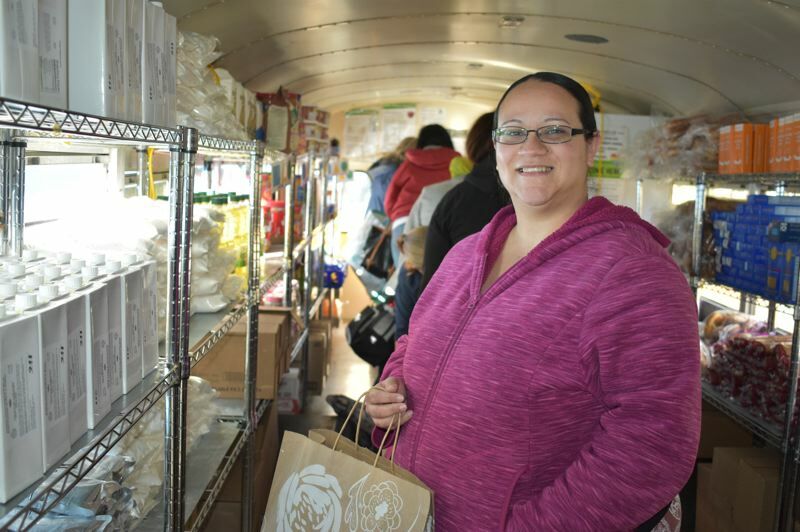 Food for Families was a bigger boost to the community than she had imagined. "I never thought we'd have 100 families in line," she said. Each distribution serves about 100 families, helping 400 to 500 people. Since its inception three years ago, Food for Families has fed more than 4,000 families, or about 18,000 people in the Centennial community. Anyone in need can come to the bus, regardless of whether they live in the district. As a measure of hunger locally, 68 percent of the students in the Centennial district qualify for free or reduced price lunch. Despite the rapid growth in the number of clients, "It works really smoothly," Giard said. "Even in the cold and the rain, we get 'er done." 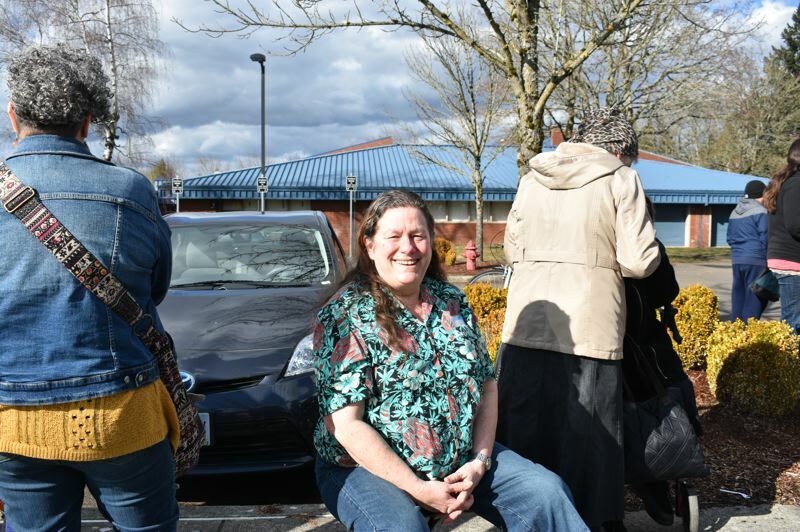 "Food for Families is a unique program," noted Kirsten Wageman, executive director of SnowCap Community Charities, which also runs a large food pantry in Gresham. 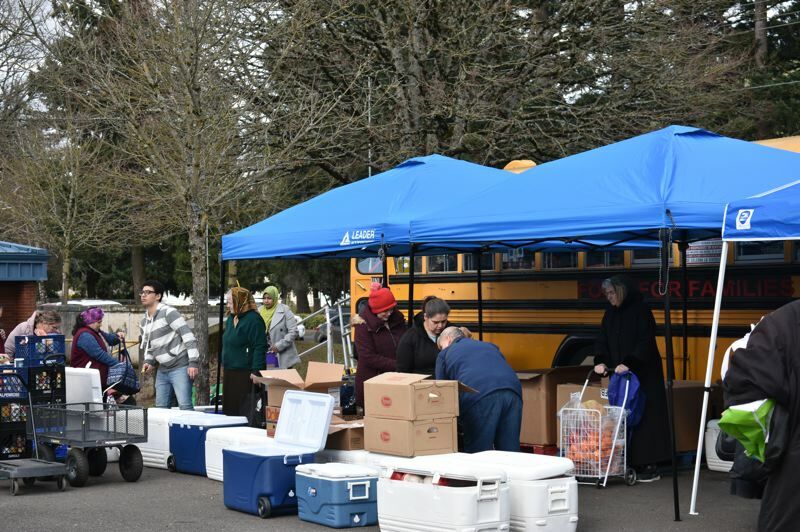 Now connected with the Oregon Food Bank, Food for Families is able to supply the bus with ample healthy food choices. 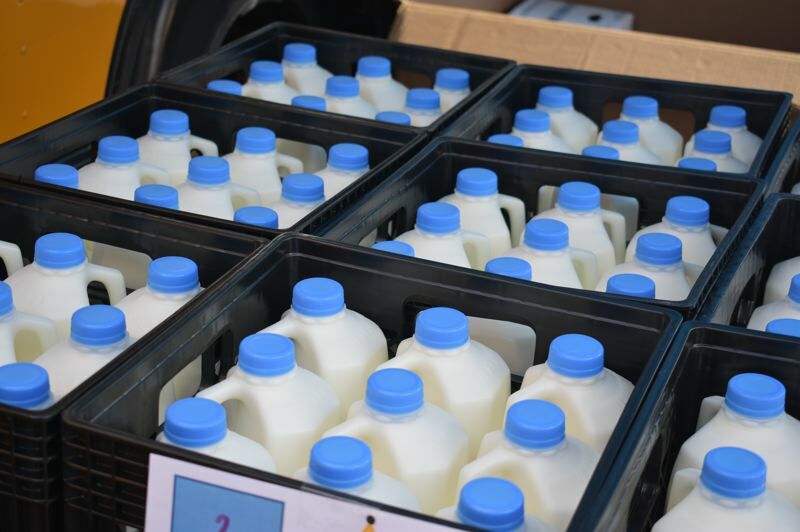 There are three donated refrigerators at the back of the bus, and in addition to non-perishable items, those in need can pick up milk, eggs, produce and even meat. There are usually two distribution days per month. Clients are given a numbered ticket, a new system instituted because people were lining up hours before the distribution time. When their ticket number comes up, clients come in the front of the bus, are assigned a volunteer personal shopper, and are able to shop for the food they want. The amount depends on the size of their family. Clients generally get a three-to-five day supply of groceries. Student volunteers agreed they were surprised at the need in the community. "I grew up in a middle class family and never had to worry about having enough food," said junior Sean Cochran, president of Future Business Leaders of America at Centennial High. "This made me realize there is another world, of people in need." Ameer Alsaood, a sophomore who immigrated from Iraq, noted he's grateful for the opportunity. "The community helped me, and now it is my turn to give back to the community," he said. Students said it was important to them to help their community, but also said they are getting something out of their volunteer work. They've learned life and career skills, such as customer service, time management, communication and teamwork. In addition, students are getting experience they can put on resumes for college and/or a career. Tyler Marston, a sophomore who wants to be an accountant, said "my people skills have improved" because of his interaction with clients and other volunteers. Oscar Reyes said he's become less shy, and working the bus also improved his Spanish. Kameron Berry plans to become a chef. He grows food for the enterprise and said he enjoys volunteering in a food-related venture. 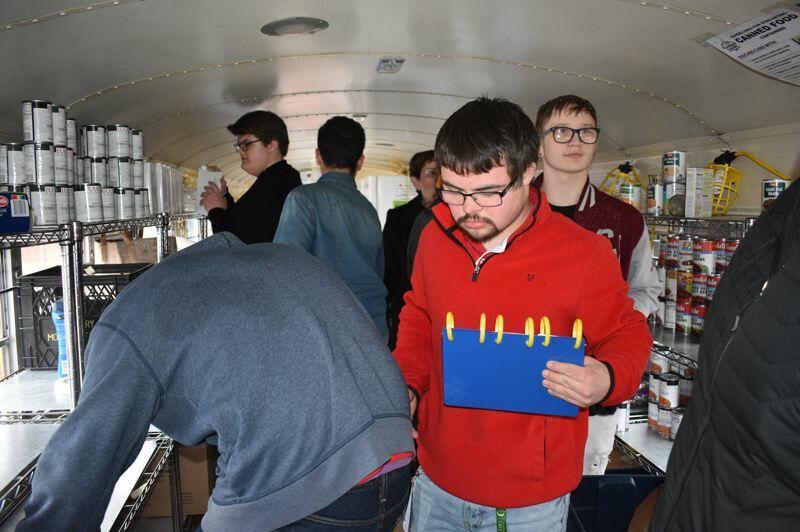 Randel Gomez and Kendall Beasley, both seniors in the school's "career explorations" class, help set up the bus and arrange things for the distribution. If the weather is bad, they put up tents and do other work. "We get work experience," Gomez said. In addition to the FBLA, other clubs also provide cadres of volunteers. Marston like to work when the drama students are on board. "They make it so much fun," he said with a grin. SnowCap's Wageman praised the student involvement. "The student volunteers are an amazing asset. It is one thing to know that there are hungry families in your neighborhood and an altogether different thing to do something about it," she said. "Taking direct action to tackle a problem as part of something bigger than the individual — especially as a young person — is powerful. "Students have so much to contribute and too often the world says 'not yet,'" Wageman added. "Providing structured opportunities to do meaningful work like Food for Families certainly will shape their understanding of neighborliness." Ellie Graham, executive director of Food for Families and one of two part-time paid staff, agreed that students also get a lot out of the experience. "They learn to be respectful of people in the community. Someone coming through the bus could be a neighbor or their best friend's parents," she said. The pantry was placed in the school bus with the original idea that it would be used to drive to different sites. But that seemed to confuse clients, and qualified bus drivers were not always available, so the bus is now permanently parked at Centennial High. That also makes it convenient for the student volunteers as well as community volunteers. The bus still has a driver's seat, but the other seats have been replaced with shelving and the refrigerators. In addition to food, the pantry has handed out coats, hats, books for children, cookware and even Christmas trees. The two part-time paid staffers are college students and Centennial graduates. Both volunteered on the Food for Families bus as high school students. 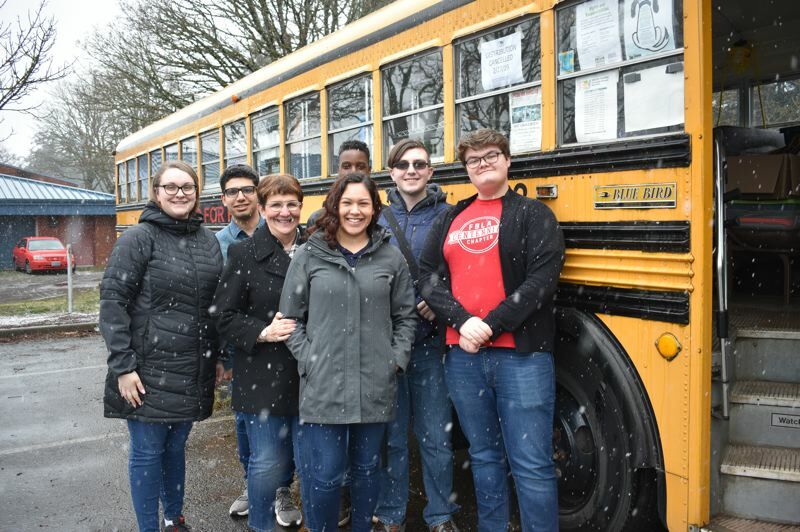 Graham, a 2016 Centennial graduate now studying at Portland State University, said connecting with Food for Families changed her life. 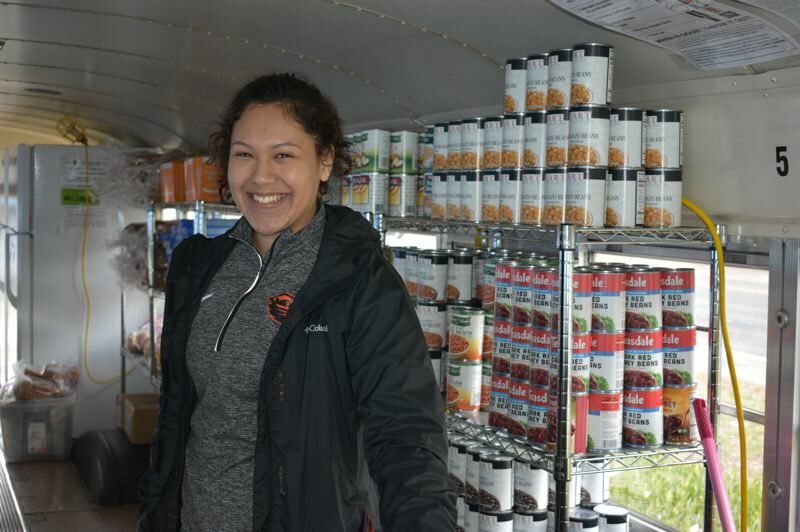 As a result of her high school experiences with Food for Families, she is preparing to go into nonprofit work. "It's making the community I grew up in a better place," Graham said.